HELP!! We are having girl #2 and I am drawing a blank when it comes to what to do in the nursery. I am going to use the same quilt and bumper from the first. It's one that I made with reds and all sorts of polka dots. I need some inspiration. Any ideas? I love your blog and always find lots of inspiration there. Tara described her style as Pottery Barn-inspired and IKEA-realized. I hear ya, Tara! So keeping that in mind, I came up with a game plan that would incorporate a classic PB style and add in the whimsy that I think is necessary in children's decorating. All of these ideas can be adapted to fit a budget, and I've included (on the more expensive items like rugs) a variety of choices at different price points. First, although Tara and her husband live in a rental, they are allowed to paint! Hooray!! Tara mentioned that she was thinking of a creamy white for the walls. I love that idea. 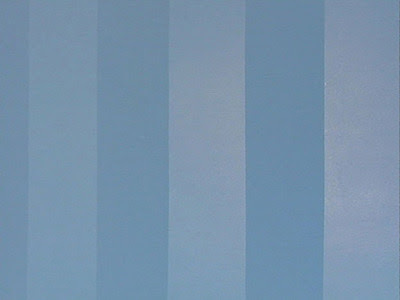 But to add a subtle bit of interest I thought it would be nice to use stripes. This can be accomplished in one of two ways. (1) Tone on tone - two shades of white, one slightly darker than the other or (2) The same shade in two different finishes, one being matte and the other glossy. Option (2) is my personal favorite idea and is very subtle, but also sophisticated. Although this would be done in creamy white, here is a picture of what I'm suggesting done in blue. Tara mentioned that she is re-using the bedding from her first baby girl which is red and white with polkadots, and that her crib is dark cherry wood. With this in mind, I went with a color scheme of red, pink and white with touches of green. This will contrast beautifully with the dark wood. Tara wanted to find fabric that would coordinate with the bedding and pull the red out. 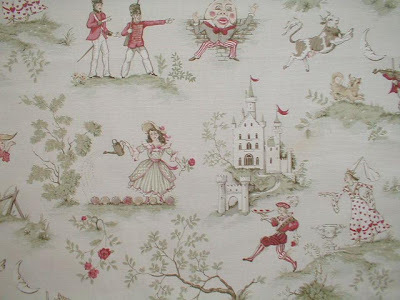 She mentioned the idea of a toile. I found these two very different toiles that I think would work equally well in the space. The first is P Kauffman Animal Tale - mint. It is a slightly more gender neutral and quite sophisticated. 15.99/yd at thefabricfinder.com. The second is P Kauffman Over The Moon - Antique. This print is very girly and I just adore it!! Tara has one large window in the space. 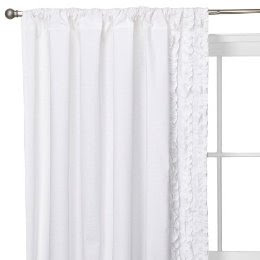 I would flank the window with straight panel curtains in either one of these toiles and use the following curtain panels in place of sheers underneath (because they will give offer some - albeit limited - light control). Swiss Dot Ruffled Curtains from the Simply Shabby Chic line at Target. 19.99 per panel. 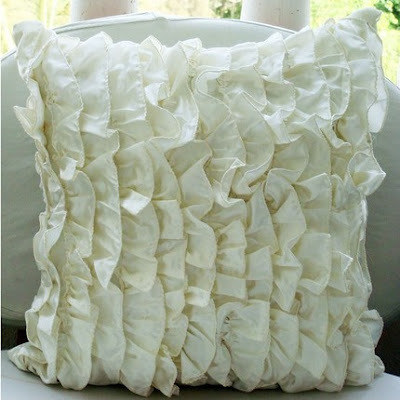 Continue the ruffled feeling with a fabulous pillow such as this one found on Etsy. 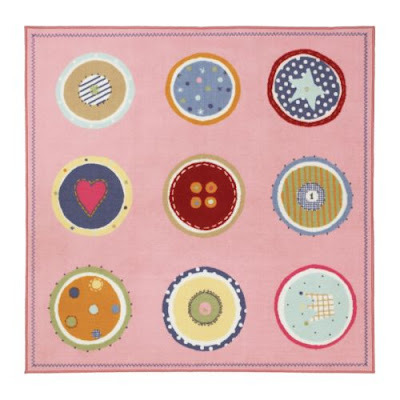 It could be used in the crib to add softness (although it would have to removed when baby was in the crib, of course) or on a chair to add softness and femininity. Every room needs artwork. Here are a couple of great ways to personalize the space just for baby. This first idea comes courtesy of my good friend Kasey. Each letter of baby's name (in a different font) can be framed in its own mismatched frame and placed whimsically above the crib. Tara could use either shabby white frames like Kasey did, or dark cherry frames to match the crib. And what could be more classic than a silhouette? Tara can choose from a number of different silhouette styles and can change the color from red to either pink or green at Sarah and Abraham. Custom name prints 8x10 - $20, 11x14 - $30. Tara also mentioned that there is a lack of light in the space. What could be prettier in a nursery than a chandelier? This little number is from IKEA and costs a mere $39.99. Although it is meant to be hardwired, any chandelier can be converted to a plug-in with a swag kit available at your local hardware store. Finally, every room needs something soft underfoot. I've chosen three fabulous options for Tara. 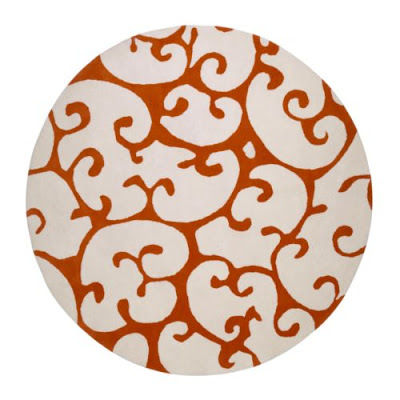 Option #3 The Alvine rug by IKEA. 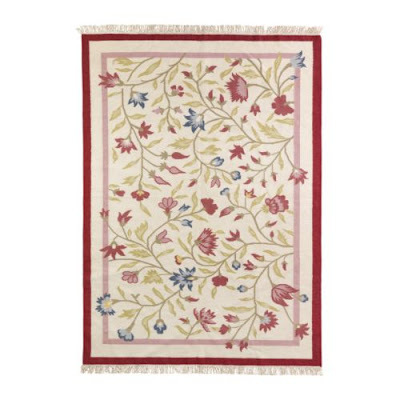 This rug is my personal choice because it is classic, fairly understated and incorporates all of the colors in the color scheme without focusing too heavily on one. It measures 5'x8' a perfect size for Tara's 12x12 room and costs a reasonable $149. Put it all together and what do you have? A fabulous nursery that is both sophisticated and whimsical and ready to welcome baby!! Congratulations Tara on the impending arrival of baby girl #2! I hope these ideas help! I love the Over the Moon fabric. I have seen that before and think it's so cute. All of the choices you've given are great. I hope it all works out for Tara. That second fabric is incredible!! Wow I love it! Ooh I adore those pillows. You can also find something similar at Tai Pan or Pier 1. Adorable! lovely little room this will be. Tara will have to show us the final outcome! You ALMOST have me wanting another baby! lol This room is sure to be lovely...I hope we get to see the finished look too! 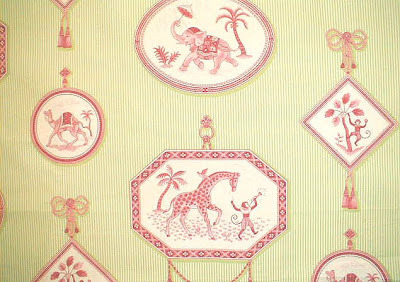 Especially love the wallpapers! This post made got my creative juices flowing. I am trying to redo the girls room right now and am a bit stumped. You have refreshed me! Thanks!!! Love this post! Great ideas. So cute! Love that Over the Moon fabric. 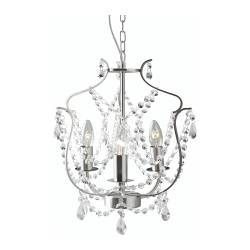 We just bought that IKEA chandelier and it is wonderful!!! I smile every time I walk into our entry now! Very cute! Wow...I really like that third rug you posted. I might have to find a place to put that one! The fabrics are especially cute! Thank you so much for all the great ideas. I am just about ready to start unpacking all the storage in the room to get it ready for our little one. I needed an inspirational kick in the pants...and you gave it to me!! Thanks again! I'll send you pictures when we're finished. Cross your fingers that it will be finished before the baby arrives! Wow . . . what great ideas! Love the color scheme and all the little touches. Fabulous room! Amazing, Wendy. Love all the ideas and those fabric choices are fantastic! I am sure will all those wonderful ideas and inspiration, she will have a gorgeous nursery for her new little sweetie! Nicely done, Wendy! I specialize in Children's Interior Design (Jack and Jill Interiors) and love your recommendations. I'd like to add that my licensing partner, Dish and Spoon Productions, who now carries my Sherri Blum Designs art collection, will custom color match artwork to any of your bedding! You can select a wall art design from their expansive collection and they will custom match the artwork to your swatches providing you with hundreds of children's art designs to choose from. And all their products are eco-friendly. Nice post! I'll visit often!Best wishes, Tara!